So at Re-Nu we can help you to optimise your time and maximise your results by having the simple, quick, and painless aesthetic treatments that feature our Endymed PRO 3DEEP RF skin tightening technology. You will instantly see immediate visible improvements and long-lasting results. Your skin will look clearer and you will attract new collagen growth. With EndyMed’s aesthetic face and body treatments, you will enjoy more comfortable procedures with an outstanding clinical data profile and excellent aesthetic results. With less pain, and less downtime why would you choose anything else!!!! EndyMed’s 3DEEP RF skin tightening treatments stimulate your body’s natural collagen renewal process leading to skin tightening and a reduction in the appearance of wrinkles. Consult your practitioner and choose from body contouring, facial skin tightening, or body tightening. Tightens and lifts lax and sagging skin in the cheek, jowl, neck and décolletage. Tightens skin and reduces wrinkles. Tightens and lifts skin in the eye area; under the eye, above the eye and above the brows. Tightens skin and smoothes fine lines and wrinkles. NDYMED FSR is the ideal treatment for fine lines and wrinkles, sun damaged skin and impaired texture and tone. 3DEEP Skin Science is used to rejuvenate the skin from the outside in. It does so by using radiofrequency in two ways simultaneously; controlled micro-resurfacing and dermal heating. Micro-resurfacing increases epidermal cell renewal to smooth fine lines and wrinkles and brighten the complexion. While the dermal heating works deeper in the skin, using heat to kick start dermal rejuvenation, encouraging the production of collagen to firm and tighten the skin. A course of three treatments can be carried out for the full face or to target those common areas of concern, around the eyes and mouth. ENDYMED FSR can also be used to treat scars and stretch marks with fantastic results. ENDYMED INTENSIF rejuvenates the skin from the inside out, delivering the ultimate treatment for deep lines and skin laxity, while remodelling the skin’s underlying structure and restoring its vitality and radiance. During this clinically advanced treatment, radiofrequency is delivered three layers deep into the skin using unique, non-insulated gold needles and fractional pulse mode technology, creating fractional columns of coagulation and volumetric heating up to a controlled depth of up to 5.0mm. This kick starts the rejuvenation of the skin by stimulating the production of collagen, hyaluronic acid and other key components of the extra cellular matrix, while also increasing epidermal cell renewal. For delivery by a Healthcare Professional, a course of three treatments is recommended for full facial rejuvenation and is also a highly effective treatment for body scarring and stretch marks. EndyMed uses controlled, focused radiofrequency, through 5 treatment modalities, to stimulate your skin’s natural rejuvenation process to achieve natural looking, and long lasting, results. 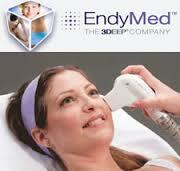 EndyMed TIGHTEN: Tightens and lifts lax, sagging skin to reduce fine lines and wrinkles on the face, jowls and neck. EndyMed FSR: Resurfaces the skin to improve skin texture and tone whilst helping to reduce fine lines. 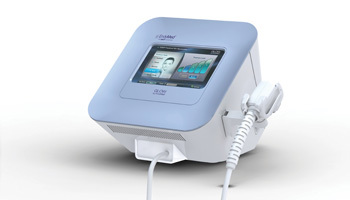 EndyMed INTENSIF: Dermal rejuvenation to redefine facial features by tackling deeper lines. Radio frequency (RF) Endymed Pro skin tightening is an advanced technology that safely heats the collagen in the skin. If enough energy is delivered, the collagen will contract, providing an immediate change in skin appearance. The treatment also triggers a second process of new collagen production, leading to a significant change in your skins appearance. A result of collagen remodelling is to give you tighter, younger looking skin. RF has two major intrinsic advantages over other technologies: 1) it penetrates deeper into the skin and 2) it is not affected by your skin colour making it a firm favourite for our clients. The 3DEEP Endymed pro technology is efficient for most body areas. We can treat the eyes/cheeks, jowls/neck/decollatage/stomach/thighs/cellulite/lips. We have developed different applications which are customised for various body areas. Dedicated handpieces on our systems assure that most effective treatments. During the treatment the deep skin layers are heated gradually, while the skin surface remains around 40° C (hot shower temperature). Your skin temperature will be constantly monitored. Depending on the size of the treatment area, treatment may take between 30-45 minutes. The treatment is relaxing, pain free and carries no side effects. After your treatment, you may immediately resume all your normal activities. You will be slightly red around the treatment area, which usually disappears in a couple of hours. With Endymed Pro you will require a course of up to six, in intervals of one to two weeks apart. You should start to see improvement in your skin following the second treatment and additional improvement will gradually appear as the treatment course progresses. As new healthier collagen is formed, tighter, more natural looking and firmer skin will be produced. The gradual improvement in your skin will continue even after completion of the treatment series. We aim to see you back in 3 months when full treatment is achieved.